Thought that this week that we would visit an old, dependable workhouse and see how it’s doing these days. “TextSoap helps you fix up all those goofy things you deal with every day when you work with text. TextSoap cleans up your text, all while maintaining your text’s font styles. 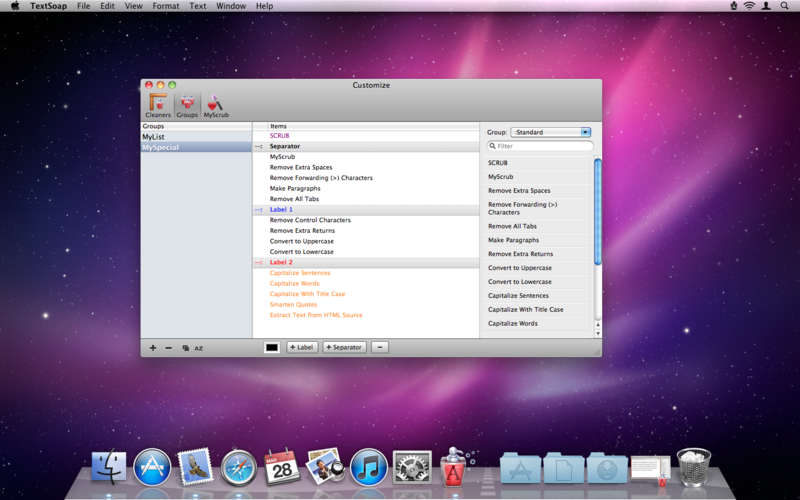 TextSoap also helps you take control of formatting your text. I’ve been using TextSoap for ages. Let’s see what’s new. First, if you didn’t notice in the opening, TextSoap is available for a limited time for $29.99, instead of its usual $39.99. That’s a $10 savings. That makes it a no-brainer, particularly if you do a lot of writing. Of course, if you just need the basics, you could always purchase TextSoap express, available at the Apple Store for $23.99. 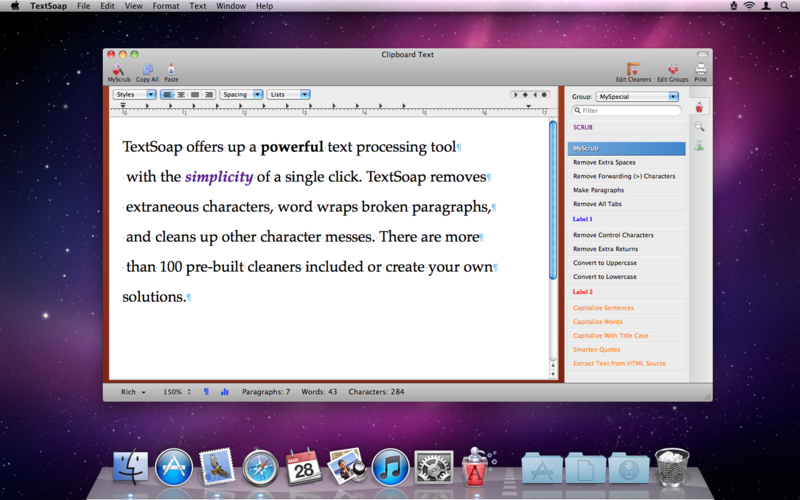 TextSoap makes it easy to reformat any text in any way that you desire. You can use their presets or create customized one of your own. You can use batch file cleaning to easily process a whole collection of files, clean up rich text of unwanted characters or formatting issues, or create your own custom cleaners for your specific needs. Power users have extra tools. TextSoap has had Unicode support from the very beginning. You can use ‘conditionals’ to bring powerful ‘if-then’ behavior to your text transformation, interactively test regular expression results with built-in Regex lab, or create custom groups to provide quick access to the cleaners you need. If you have deadlines or just would like to streamline your workflow, this app will save you lots of time. You should spend at least an afternoon with it to learn all of the power it affords you. Even nicer yet, it is available in the Services Tab of many of your most used apps. For example, I’m writing this review in Evernote and using TextSoap via the Services Tab to make my scribble nice and tidy for you. I have nothing negative to say about the app. However, I do hope that unmarked software has iOS versions in the oven. If you’re a newbie and trying to assemble your indispensable toolbox, this is one of the apps that you should have. If you’re an Apple veteran, you should have TextSoap in your arsenal. If not … naughty, naughty. And remember, to set aside the time to learn all of this app’s tools. I hope that in the not too distant future to be able to tell Siri to select a paragraph and apply one of TextSoap’s tools to the selected text! Ooops … running late. I’m do back on Earth. This entry was posted on Wednesday, June 20th, 2012 at 3:34 am	and tagged with iOS software, Mac software, Utilities and posted in Reviews. You can follow any responses to this entry through the RSS 2.0 feed.